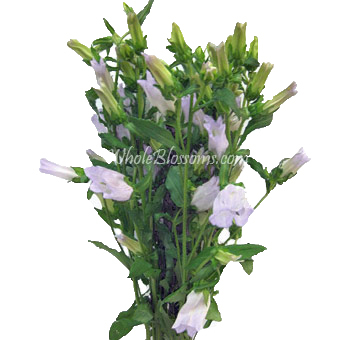 Campanula is also known as bellflower, it is commonly used to accent bridal bouquets and table centerpieces. It is characterized by its bell shaped blooms which has helped to popularize this colorful breed for use. It is available throughout the year in purple/blue, lavender, pink, and white. They are harvested and packed at the farm, are shipped directly to you so that you can enjoy the longest vase life. Campanula flowers are famously called as Bellflowers owing to their shape. Both, the scientific name, Campanula and the generic name,Bellflower originate from the bell shape of the flower. Campanula is the Latin translation for ‘little bell.’Campanula flowers are famously called as Bellflowers owing to their shape. Both, the scientific name, Campanula and the generic name,Bellflower originate from the bell shape of the flower. Campanula is the Latin translation for 'little bell'. The Campanula flowers are native to the northern hemisphere where the temperatures are tropical. This means they are ethnic to and predominantly found in the Mediterranean region, but can also found in Africa and Asia. They grow in an increasingly vast number of areas that allow it as they are in high demand due to its many uses. They also need to be grown in high volumes as they blossom in fixed intervals. The Campanula flower plants produce flowers annually, biannually or perennially, depending upon the species. Based on the surrounding terrain, the plants grow to a height between 5 cm and 2 meters. The leaves on a single Bellflower plant may differ in shape and size. Leaves on the bottom of the plant are often broader and reduce in size as they go higher. The difference in leaf shape and size offers a different effect when they are incorporated into bouquets and other decoration forms.The non-standard leaves give an effect that is natural and untouched. The leaves also contain a white latex substance in the leaves and stems. Campanula looks stunning when placed amongst other flowers or even just by themselves. They can be incorporated in wedding bouquets, centerpiece décor designs or even as a part of a larger setup. They add a significant amount volume and texture to any arrangement. They even look grand when placed in a vase in a house. The wide range of available colors will enable the blending of the flowers with the upholstery, making the home feel fresh and vibrant. The wide range of uses has made this a flower that is in high demand.Therefore, it would be wise to buy your campanulas from reliable and reputed wholesalers who pay attention to detail in their horticulture. The flowers grow individually and have 5 petals each. Campanula flowers grow in a range of colors. While they are most commonly found in shades of blue and purple, they also grow in pink and white. They can be paired with standard colors for a monochromatic effect, such as all blues. They can even be paired with campanulas of different colors. They will all be of the same shape and size and therefore will look good in bundles of different colors. Blue, pink, purple and white, all these shades offer a burst of colors that catch the eye of all. 'Campanula flowers' or ‘bellflowers’ is a broad term used to umbrella a variety of flowers. There is an average of 300 different types of Campanula flowers. Each variant differs from each other on the basis of size, the height it is grown at and conditions. There are numerous bellflowers that have gained quite popularity when it comes to decorations. Bluebellsare the most commonly grown and found Bellflowers. Most predominant in the highlands of the North American region the can also be found in the British Isles. Bluebells often grows up to the height of 10 feet.Dwarf Bellflowers do not grow taller than 3 inches, but they can grow up to 5 times wider than their height. They usually grow in rocky crevasses and look lovely when placed in gardens. Unlike other Campanulas that are delicate, the Carpathian Harebells are rather tough. They grow to a height of 12 feet and produce some wonderfully amazing looking blooms. The American Bellflowers are a task to grow and maintain, mainly because they bloom flowers that are only 1 inch in size. However, once bloomed, the efforts are all worth it. Other Campanula variants are Birch Hybrid, Pink Octopus, Campanula Viking, Dickson’s gold, Milky Bellflower and Champion Pink to name a few. 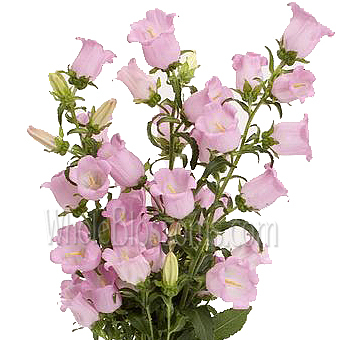 Campanula flowers are an ideal addition to any flower decoration. They are delicate, beautiful and add a pleasant, fresh touch to any décor designs. Available in blue, purple, white and pink Bellflowers are the perfect floral choice for weddings, parties and any other special event. They can are also usedfor wedding bouquets, floral wall décor, centerpieces, vases, or even looked absolutely spectacular when suspended and hung from the ceiling. For events, clients need to buy flowers and from wholesale retailers in order to get the best price. Whole Blossoms is one such reputed wholesale supplier for all flowers. 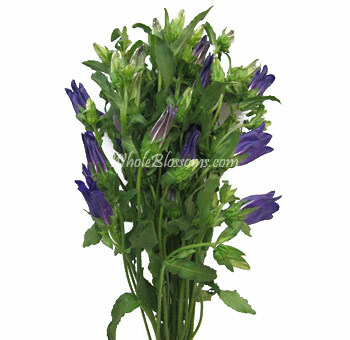 If you wish to order Campanulas, all you have to do is contact Whole Blossoms. They are leaders in the market when it comes to the supply of fresh flowers at affordable rates. They provide clients with doorstep 24/7 delivery of all flower types.